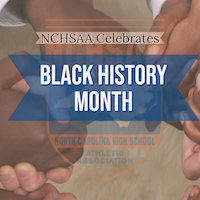 Celebrating Black History Month: Donald Davis, Sr.
Donald Davis, Sr. from Burlington has a long track record of dedicated service to Cummings High School’s track team. Davis has served the City of Burlington as Superintendent of Sanitation from 1980 until 2006 when he retired. From 1987 until 2003 when he was named the Cummings Head Track and Field Coach, Davis volunteered as Assistant Track and Field Coach for both the indoor and outdoor teams. He has been a part of 27 team State Championships, spanning from 1987 to the 1A/2A Women's Indoor Track & Field Championship his Cavaliers won this past weekend. His teams finished as state runners-up 12 times, he coached over 140 Individual Event State Champions and 31 State Meet MVP’s. Remarkably, he coached at least 1 state champion in the hurdles events for 24 consecutive years. Davis has helped raise money to resurface the track at Cummings and annually raises money to provide rings for championship teams as well as travel funds for athletes who qualify for National High School Championships. Davis’ love of track and field also has propelled him to work 30+ hours a week during the summer as an Associate Head Coach of the Durham Striders Youth Organization since 1983. He was inducted into the Cummings High School Sports Hall of Fame in 2011 and was named the United States Olympic Committee’s Developmental Track and Field Coach of the Year in 2012. In 2016 the NCHSAA inducted him into the Association's Hall of Fame along with the Class of 2016.